WHITE — At the Utica State Asylum, Sept. 4th, 1860, Samuel S. White, of Independence, Allegany County, aged 64 years. Mr. White had been suffering from a partial, and at times, a total mental alienation, since about the 9th of October of last year. In the fore part of November, he was removed to the Asylum, where his last days were spent. After he became an inmate there, his physical health seemed to improve, and with it, his mental; especially was this the case during the past spring. But, in the fore part of August, pulmonary consumption set in, and terminated in his death within a month. Mr. White settled in early life, forty-two years ago last April, in the the town of Independence, earnestly and successfully devoted himself to business, and was prospered beyond the lot of most men. By the 1850s, mental alienation was considered a disease of the brain that was treatable. Its causes and cures were rooted in environmental factors found in food or water and social issues like a stressful work environment. 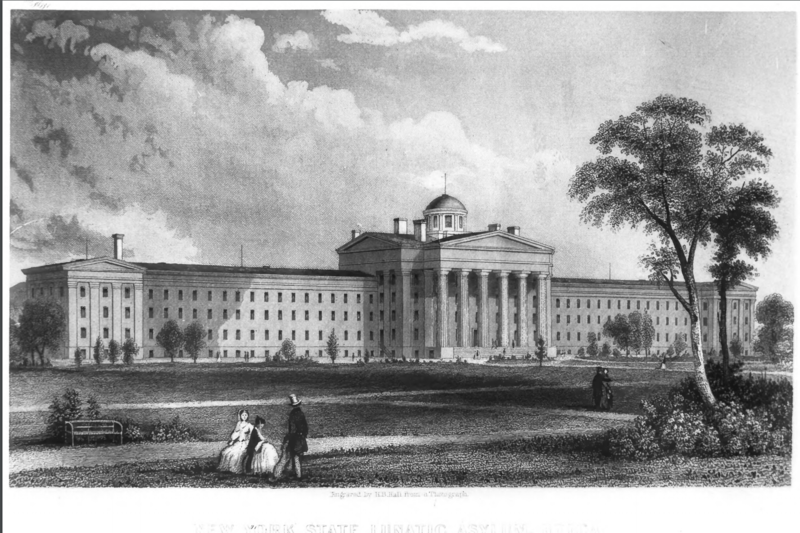 The New York State Asylum at Utica was the institutional home of the American Journal of Insanity, and through its Superintendent, Dr. John Gray, at the forefront in the treatment of mental illness. It was held that insanity was curable, but that the patient had to be totally isolated from family and the stresses of society. An orderly, controlled environment of light work, recreation and rest was essential to the cure. In instances in which a patient was at risk of harming him/herself or others, restraints were used. One such device was the “crib”, a box shaped bed with a cover of slats, which was securely locked while the patient was inside. Samuel White was ill in October 1859. However his mental instability manifested itself, his wife, Nancy Teater White, and children must have been gravely concerned, seeking the counsel of their local physician. The decision to continue treatment at Utica was probably one of hope, with an expectation that this community leader would return home, cured of his mental alienation. 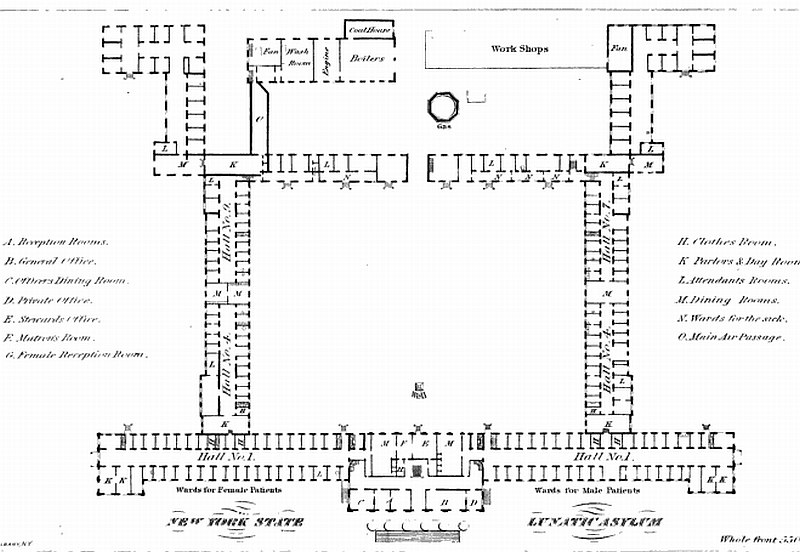 Samuel was seen by Dr. Gray, diagnosed as insane and admitted to the men’s ward of the great Greek Revival building in early November 1859. What treatments did Samuel require that winter? Was he permitted to socialize among the other 300 patients; or was he contained in a “crib?” And at the end, as he lay dying of pulmonary consumption or tuberculosis, did Dr. Gray break the rule forbidding contact with family, and allow Nancy and his children to visit, to comfort him as he passed over? 2. Era of Asylum. “Overview of Mental Health in New York and Nation.” New York State Archives. accessed September 29, 2012. 3. “A visitor to the Utica Insane Asylum.” Weekly Wisconsin Patriot. (Madison, Wisconsin). Volume 6: Issue 42: page 2 (Saturday, January 7, 1860). Accessed on GenealogyBank.com September 29, 2012. One of my great granduncles went to Utica in 1879, categorized as a “crazy man” but “deemed curable” (from the Evening Auburnian) and later went to the Willard State Hospital. When you read about conditions and treatment at these facilities, it’s hard to think about an ancestor experiencing that life. individual to fall on hard times and not recover. Likewise, Jill. Recognizing some of my current problems as just so much human drama helps me gain perspective – Do the best with what you have today.